Home / Blog / What would a week without volunteers be like? This Volunteers’ Week our Chief Executive, Oonagh Aitken contemplates a world without volunteers, and in times of uncertainty explains why ‘volunteering for all’ is more important now than ever. What would a week without volunteers be like? Support for older, isolated people and vulnerable families, or young people leaving care would be dramatically reduced. As would activities for disabled people to get out and enjoy their independence. There would be vastly less help in hospitals to take the pressure off medical staff. No extra sports coaching, refereeing or club support. The list is endless. The social and economic impact of volunteering in the UK is immense. Volunteering Matters is only one of a host of organisations which deploys volunteers in all sorts of ways. Our volunteers, nearly 30,000 of them each year, organise activities for older people as well as supporting them to get to GP and hospital appointments; they support vulnerable families and are mentors for young people leaving the care system; they are there for disabled people so they can continue their studies and get out and be active in their own communities. Our volunteers are not providing a replacement for public services that national or local government cannot provide; they are alongside paid professionals providing additional assistance to complement the professional role. Our Full-Time Volunteers, aged 18 to 35, provide support in all sorts of settings, supporting people with disabilities to live independently, providing additional support in special schools, assisting in shelters for vulnerable young people and so much more. This year’s Volunteers’ Week theme may be Volunteering for All, but can we as a sector guarantee that our offer is inclusive? We know we need to focus, for example, on young people with fewer opportunities and give them access to the volunteering that will increase their skills, improve their well-being and make them more confident and resilient. To do that, we have to be creative and flexible. So we are looking to offer full time opportunities that are shorter and that speak to the interests of young people. At the same time Brexit has left us in a uncertain position vis a vis our relationship with the European programmes that have supported young people to volunteer across the EU. We host young full time volunteers from all over Europe and beyond and we increasingly want to facilitate opportunities for young people from the UK to have that kind of transformative experience with our European and international partners. Through the European Volunteer Service, EU Aid Volunteers and partnerships with a range of countries beyond Europe, we want to make volunteering opportunities available to our young people and fervently hope that our government will continue to support the European programmes that make this possible after the UK leaves the EU. The European Commission proposes from 2020 to double the funding for Erasmus +, the programme that makes the mobility of young people possible. Who wants to see British young people denied the opportunities given to their peers in other European countries? Yet uncertainty is a challenge and also an opportunity. 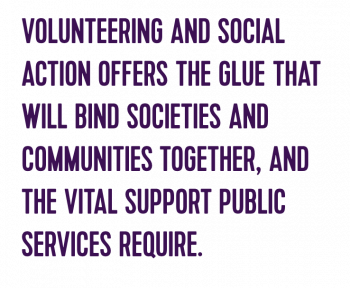 We believe that at such times, volunteering and social action offers the glue that will bind societies and communities together, and the vital support public services require. We will continue to work to offer transformative volunteering opportunities for people of all ages and abilities across the UK and beyond, and adapt our offer to the changing needs of society to make sure we achieve volunteering for all now, and long in to the future.